For a full dinner table setting, I used the Friendly Village rimmed soup bowls on some lovely bronze chargers I found at Ben Franklin Crafts. The flatware, stemware and table cloth with matching napkins remained the same, but I switched out the center piece, using a cut-glass compote made in Western Germany (thrift store), flanked by two Mikasa Diamond Fire star votive holders (thrift store). 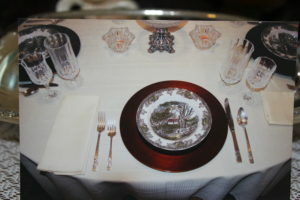 The next course was the entrée using the large dinner plate, followed by a salad course using the square salad place (following the French manner of the salad course following the entrée, thus the flatware placement), and finally a dessert course using the round salad plates and berry bowls. Cover with rimmed soup bowl, also known as a soup plate, with bronze charger.